Kids in the Kitchen is a project that promotes children's health and wellness. This effort teaches and demonstrates how to prepare healthy meals and snacks that are tasty, easy to prepare, and affordable. Sessions include exercises for kids, tips on nutrition, and recipes for meals and snacks. The Junior League of Greater Winter Haven partners with Girls Inc. of Winter Haven and hosts a Kids in the Kitchen session once a month with their after school program. 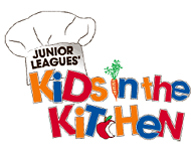 Throughout the year, the League also hosts Kids in the Kitchen activities at a variety of community events.